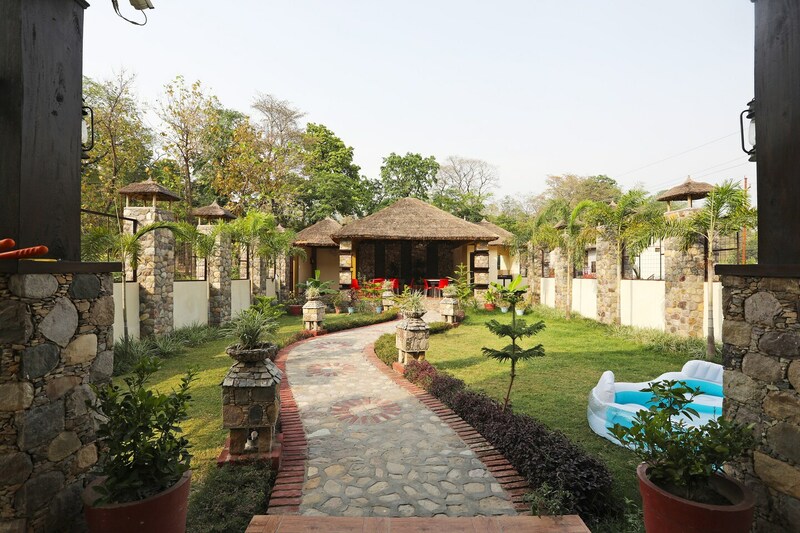 Corbett Jungle Habitat is a lavish property with well-maintained garden on Dhela Road, in Semalakhaliya, Corbett Ramnagar. It is close to the Corbett Adventure Zone. Key attractions near the property are Garjiya Devi Templee, The Roar Adventure Park, and Shiv Mandir. The property boasts of a stone and concrete facade and a beautiful garden. There is an in-house kitchen and dining space. The outdoor dining area features a thatched roof and overlooks the garden. The rooms and bathrooms are modern, bright and clean. Each room is equipped with king sized bed, air conditioner, television, and wardrobe. Facilities like power backup, parking facility, lounge area, and CCTV security are also provided. Corbett Junction, Delhi Darbar Restaurant, and Panchvati Restaurant are present in the vicinity of the property.